Jiangsu Busy Man Textile Co., Ltd.
We are specialized in OEM towel production for 10 years now. No colors, no pattern and no shape limit! Fast sample lead time of 5 days and fast mass production lead time of 20 days. You are warmly welcome to our website. Here you can find whatever kinds of towel and garment you want. First, please take a look at the situation of our company. 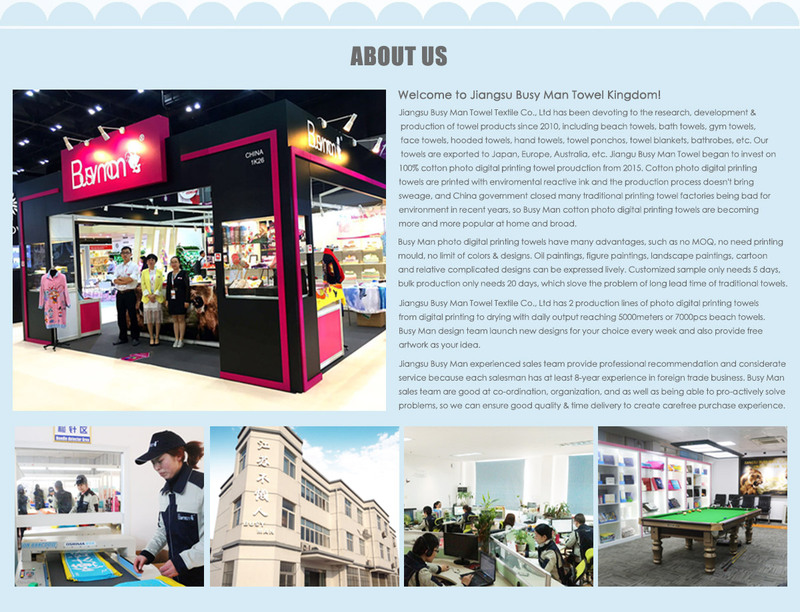 Jiangsu Busy Man Textile Co.,Ltd. is conveniently located in Nantong, which lies to the northwest of Shanghai, the estuary of the Yangtze river and is one of the top coastal cities in China, known by the world for its textile production. Our factory owns 180 sets of weaving machines, including Germany warp knitting machine, Italy rapier looms, domestic rapier looms, domestic towel machines, etc. We are also equipped with more than 300 sets of home textile production facilities, including Italian cheese dying machines and shearing machines, Japanese computerized embroidery machines, Korean quilting machines. We have established a full set of international advanced production line of pulp, weaving, bleaching, dying, sewing, embroidery, and finishing. There are 180 employees in our factory, we have quickly grown to a major producer with an annual sales over US$ 7.5 million. We mainly dealt with domestic sales and indirect exporting in the past 9 years, and we established our Foreign Trade Department early 2010, to expand markets abroad. Our towels are soft in touch, bright in color, novel in pattern. We are a leading role in the same field, and our products are popular in more than 30 countries and regions, including Japan, the United States, the European Union, the Southeast Asia, and Australia. We are skilled in management and innovation in the face of increasingly fierce market competition. In the national towel industry, we take the lead in through the ISO9001 quality management system, ISO14001 environmental management system, WRAP social responsibility system, and Oeko-Tex Standard100 mark certification of the European eco-textiles. Decade of endeavor, we have created a good market reputation of "first quality of Chinese towels". Our company is committed to providing our customers with competitive prices. 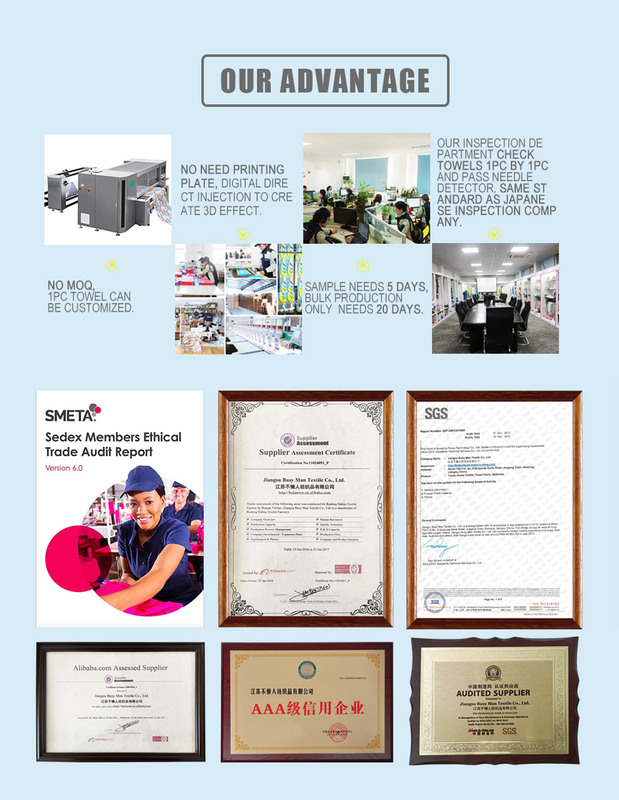 We adhere to the principle of "customer first, integrity-based" and guarantee to offer high quality products. We sincerely hope to cooperate with clients both at home and abroad on the basis of sincerity and good faith. If you are interested in any of our products, please feel free to contact us. We are looking forward to establishing business relationship with you.